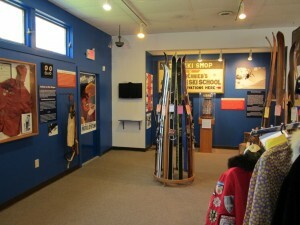 The permanent exhibition, titled From the First Tracks to the Fall Line: eight thousand years of skiing,presents a coherent chronology of the development of skiing from its prehistoric roots up until the advent of the shaped ski in the 1990s, and includes local aspects of ski history with national implications such as several important ‘firsts’ at Cannon Mountain, and the career of Bode Miller. The production of the revised permanent exhibition in 2012 was made possible partly though a grant from the Institute of Museum and Library Services (IMLS), the agency that channels federal support to museums. IMLS seeks to create strong libraries and museums that connect people to information and ideas. The exhibition features several 27 inch video screens, on which visitors can view their choices of film clips that explore topics such as ski instruction, the power and danger of avalanches, the early days of snowboarding, and the revival of the telemark turn. 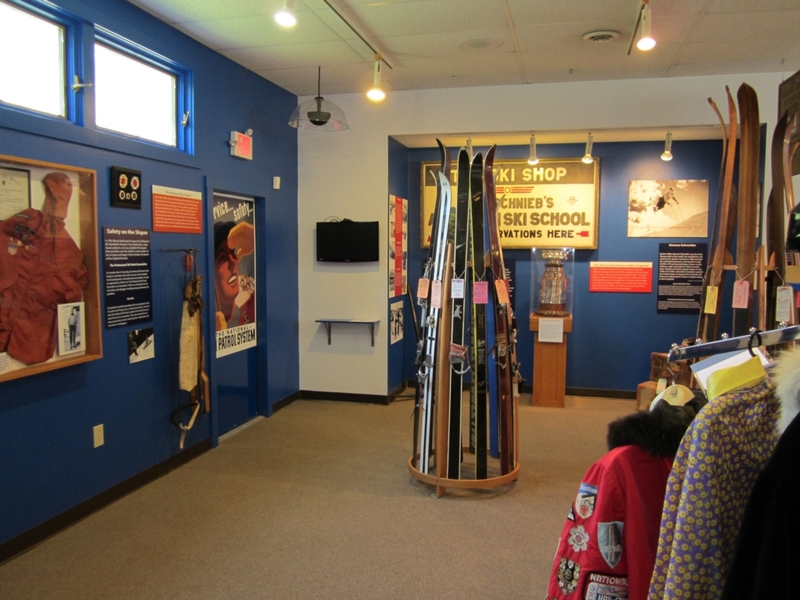 Despite the relatively small space of the museum’s exhibition hall, the film clips and in-depth articles on aspects of ski history published in the Museum’s Journal, which staff and docents make available to visitors on request, expand and augment the reach of the exhibition. 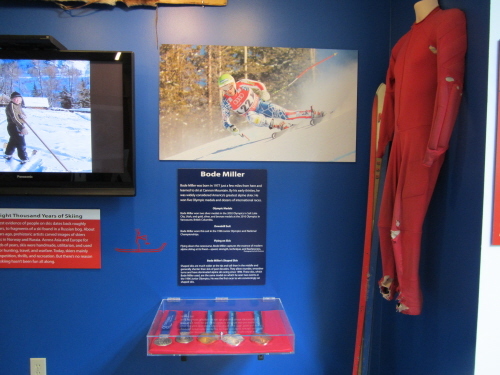 Upon entering the Museum, visitors see a short video introduction to skiing, coupled with an introductory alcove in which replicas of prehistoric skis—authentically produced by tribesmen in Central Asia who still use them—are paired with K2 Fours such as Bode Miller used when he first popularized shaped skis in the mid 1990s. Miller’s five Olympic medals on display mark some of his more recent skiing achievements. 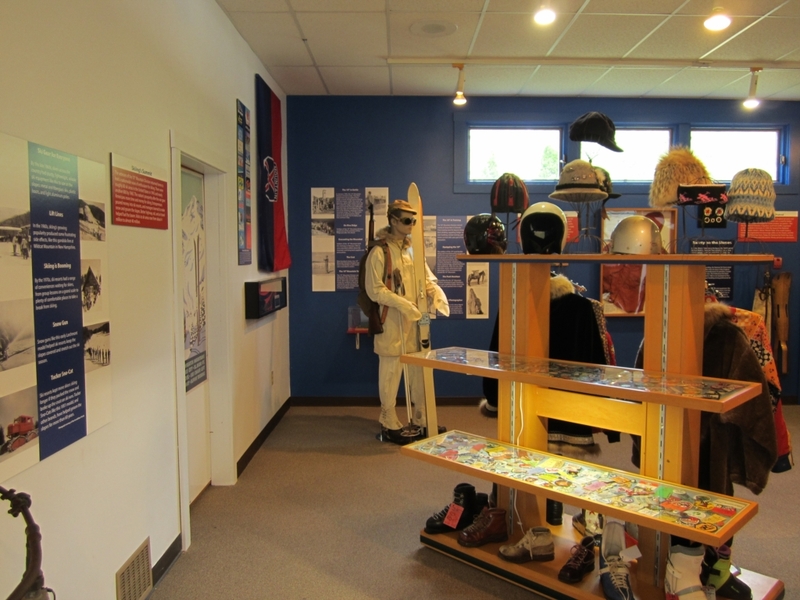 The exhibition quickly focuses in on the transplantation of skiing from Europe to New England, and especially on the rapid growth of the sport and the fledgling businesses built around the sport in the 1930s. One important aspect of that decade was the creation of the National Ski Patrol to provide first aid to injured skiers, and the NSP in turn was a key advocate of the US Army’s mountain troops that became known as the 10th Mountain Division. Following the Second World War, veterans of the 10thwere hugely significant in opening ski resorts around the country. The rise of modern ski resorts in the 1950s and 1960s was followed by a retrenchment in the 1970s and 1980s, leading to the ‘lost ski area’ phenomenon as numerous small areas closed. Nordic skiing saw increasing popularity, and two new American forms, freestyle and snowboarding, appeared in the 1970s. 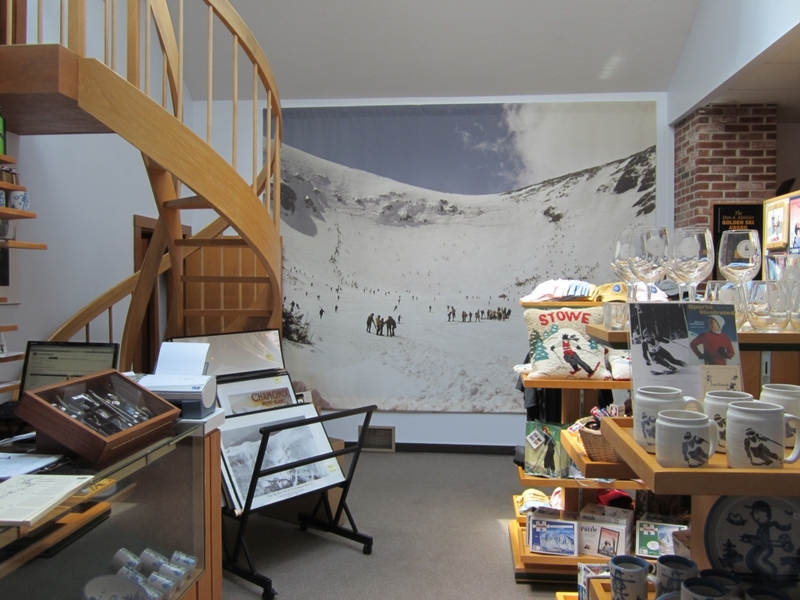 A 12-foot wide photomural of Tuckerman Ravine in the winter of 1969, noted as the snowiest on record there, closes out the exhibition, and visitors photographed standing before the mural appear to be in the ravine themselves. 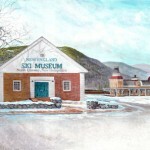 The Museum is open from 10 to 5 from Memorial Day until the end of ski season.